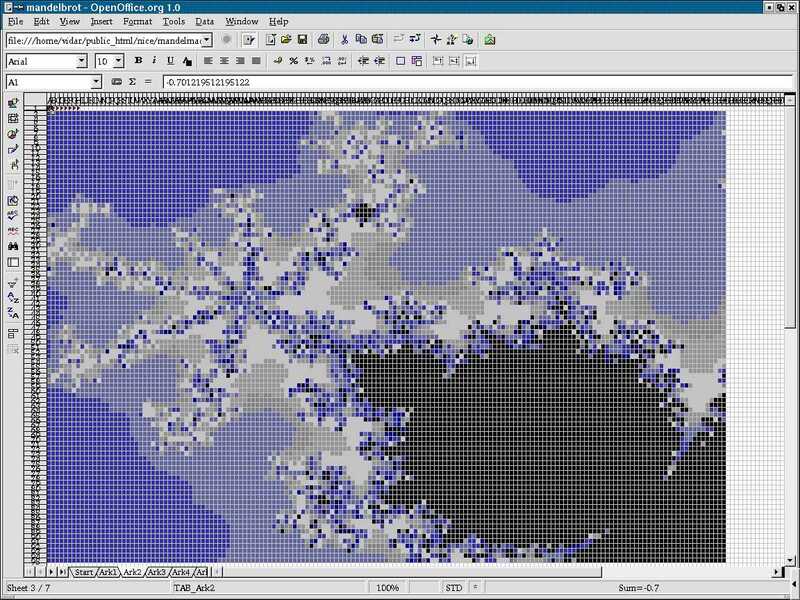 The amazing Mandelbrot Excel Macro! How bored can you get? How much boredom can a human mind contain? What is the deepest, sadest dimension of pure boredom a person can experience? I must have been close to 'borvana' when I made this macro. If you're using Excel 2000 (or fairly compatible, but OpenOffice is not), you give it a test run. If you're not, there are a selection of sample renderings. To your left is a screenshot from OpenOffice (click to enlarge). As you can see, all cells are tiny, and the background color is set to form a pixmap. You can zoom in on these things by selecting a nice area and pressing ctrl+z. There's even a contributed version with better instructions, background information, multiple colors and more! What is a mandelbrot fractal? Introduction to the mandelbrot set. "A guide for people with very little math experience". Fractal theory Slightly less practical for some, but equally interesting.